Giallo time! This Euro-thriller double biller (plus a bonus hit) opened in Mt. Pleasant, PA on July 1975. L'ASSASSINO… È AL TELEFONO (1972), starring Telly Savalas and Anne Heywood, was released by Cinema Shares International in 1975 as SCENES FROM A MURDER. It was directed by Alberto De Martino and photographed by Joe D'Amato. 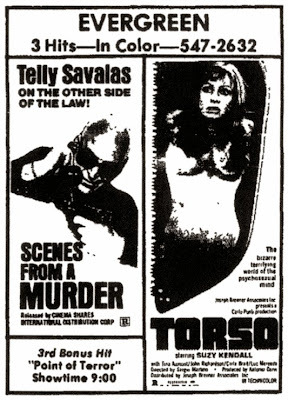 The co-feature, Sergio Martino's I CORPI PRESENTANO TRACCE DI VIOLENZA CARNALE (1973) -- starring Suzy Kendall, Tina Aumont, and John Richardson -- made the rounds in the U.S. as TORSO from Joseph Brenner Associates beginning in late 1974. The bonus third feature is POINT OF TERROR, an American shocker starring Peter Carpenter and Dyanne Thorne, released by Crown International beginning in 1971.